This paper addresses the debate on the morpho‐syntactic status of subject pronouns in the pre‐modern stages of the French language by reinvestigating this issue along with that of the number of paradigms of such elements. On the basis of a collection of the various evidence provided in the literature as well as hitherto ignored and novel empirical insights, the paper discusses the different views put forward and essentially argues that, in its medieval stages, French had two paradigms of, respectively, strong and phonologically clitic subject pronouns. From this finding as well as standard assumptions on the modern (standard) stage of the language the paper eventually concludes that, diachronically, French evinces continuity, rather than changes regarding the two issues under investigation. The Annual General Meeting of the Philological Society was held on 17 June at Selwyn College, Cambridge. Having completed a four-year term of office, Prof. Wendy Ayres-Bennett stood down as President of the Society; she is succeeded by Prof. Aditi Lahiri FBA. The following Members of Council have served their term on council or wished to retire early, and did not stand for re-election: Prof. Ruth Kempson FBA (KCL); Prof. Aditi Lahiri FBA (Oxford); Dr John Penney (Oxford); Dr George Walkden (Manchester). In their place, the following new Ordinary Members of Council have been elected: Prof. Eleanor Dickey (Reading); Dr Mary MacRobert (Oxford); Prof. Maj-Britt Mosegaard-Hansen (Manchester); Dr David Willis (Cambridge). The 9th RH Robins Prize was awarded to Jade Jørgen Sandstedt (Edinburgh) for a paper entitled ‘Transparency and blocking in Old Norwegian height harmony’, which will be published in TPS. The outgoing President delivered her President’s Lecture on ‘Standards, norms and prescriptivism’, an audio recording and screencast of which can be found below and on the Society’s YouTube channel. In this article we demonstrate how fine-grained analysis of salient features of linguistic change over a relatively short, but significant period can help refine our notions of periodization. As our case study, we consider whether it is appropriate to distinguish a period called français préclassique (‘Pre-Classical French’), and if so, what its temporal limits are. As our contemporary informants we take, on the one hand, the comments of writers of remarks on the French language, who were highly conscious of language change, and on the other, usage in successive French translations of the same Latin source text which can be exploited to track and date the adoption of ‘modern’ linguistic variants. We find atypical patterns of change – and notably changes which move rapidly through Labov’s different stages – that contribute to the sense of discontinuity or periodization. However, this sense of ‘rupture’ does not coincide with the chronological boundaries hitherto suggested for français préclassique, thus throwing the validity of this period into question. Languages are not merely a tool for communication but central to key issues of our time, including national security, diplomacy and conflict resolution, community and social cohesion, migration and identity. Learning languages then is not only about learning the words and grammar of another language but also about a deeper intercultural understanding that is not just important for individuals but for developing more respectful and effective policy. And yet multilingualism and multiculturalism are commonly problematised and Modern Foreign Languages have not yet attained the same status as English, Maths or Science in the school setting. The AHRC funded Open World Research Initiative (OWRI), which subsumes four major projects, therefore aims to explore and promote modern languages in the UK (see here for more details). MEITS is one of those four research programmes. 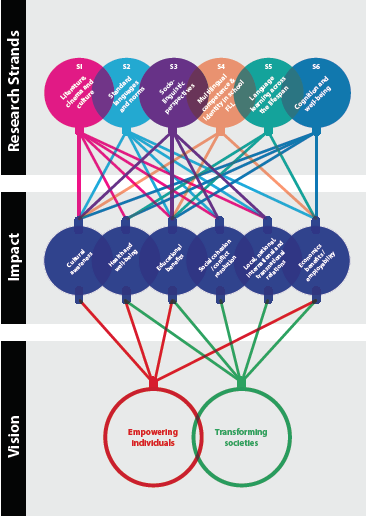 It is based at the universities of Cambridge, Edinburgh, Nottingham and Queen’s Belfast and spans six interlocking strands exploring the fields of literature, cinema and culture, history of ideas, sociolinguistics, education, applied linguistics and cognition (see diagram). What is the relationship between the multilingual individual and the multilingual society? What are the opportunities and challenges presented by multilingualism? What is the relationship between multilingualism, diversity and identity? What is the relationship between multilingualism and language learning? How can we influence attitudes towards multilingualism? How can we re-energise Modern Languages research? To this end, research strand 1 will be investigating literature, cinema, culture and citizenship in a globalising Europe by studying cultural texts and events – narrative, fiction, poetry, theatre, cinema – that foreground, problematise, and inform questions of linguistic unity, diversity, identity, power, and quality of life in the public sphere. This strand will focus on two distinct contexts at opposite ends of Europe; Catalonia, on the one hand, because of its status as an ‘autonomous region’ in Spain and Ukraine, on the other, due to its recent conflicts over the legacy of empire and colonialism. Despite inherent differences, these regions share the instrumentalisation of language for the renegotiation or secession of national identities. Spanning from the 19th to the 21st century, strand 1 of the MEITS project will investigate how and why language is politicised in multilingual contexts and the role of culture in this process by undertaking formal-aesthetic and symbolic-ideological analyses of texts and contexts. Strand 2 also focuses on societal multilingualism and will provide a comparative perspective of standard languages, norms and variation in multilingual contexts. The role of multilingualism in relation to standard languages will be analysed synchronically and diachronically in national and transnational contexts (e.g. : France/Francophonie) alongside pluricentric (e.g. : German) situations where languages vie with other languages/varieties on cultural, political and ideological grounds (e.g. : Ukrainian, Irish, Mandarin) by combining methods from the humanities, sociolinguistics and historical sociolinguistics. The question of identity is central to many of the projects and will be explored from an individual and a social perspective in the third strand of the MEITS project. The contexts of Ireland and France will be contrasted as the first has an official language that is both minoritised and dialectal while the latter has a single standard language that is highly standardised and dominant despite the richness of regional and heritage languages in France. Quantitative and qualitative approaches will be blended to investigate issues such as urban language in multicultural contexts, regional identities, as well as the role of language for social cohesion. Multilingual identity is further investigated in strand 4 of the MEITS project, where its connection to motivation and attainment in foreign language learning will be studied. To this end, the development and expansion of multilingual identities in early foreign language learning among monolingual adolescent learners and their peers with English as an additional language will be charted. The cognitive and social dimensions of motivation will be studied in intervention and matched non-intervention classes using a mixed methods design. Instructed foreign language learning is also the focus in strand 5 of the MEITS project where the influence of age, language-specific factors and setting on the language learning process and progress will be studied. The aim of this strand is to investigate whether an earlier start indeed is better in the context of minimal input settings or whether cognitive changes during adolescence might actually make young adults more successful language learners. In order to achieve this goal, a combination of linguistic and cognitive tests will be employed to assess the language learning process and attainment in learners of different starting ages in a longitudinal study. Finally, strand 6 shares its interest in cognitive processes with strands 4 and 5 and will study the impact of multilingualism on motivation, health and well-being. This topic will be approached from two perspectives. On the one hand, the cognitive effects of intensive language learning in late adulthood will be studied and on the other, bilingual and monolingual children with autism will be compared in order to establish whether cognitive advantages associated with typically developing bilingualism can also be found in bilingual children with autism. This brief overview of the MEITS project shows that the six research strands are closely intertwined, facilitating the development of new interdisciplinary research paradigms and methods which will allow for a more holistic approach to the study of multilingualism on a societal and individual level. Through this integrated approach and our close collaboration with partners from outside higher education we aim to change attitudes towards multilingualism and highlight its benefits for cultural awareness, health and well-being, education, social cohesion, (inter)national relations as well as employability and thus empower individuals and transform societies. If you want to learn more, visit the project’s website and/or follow us on social media (on facebook, twitter: @meits_owri).